With the lunation of 5 in your fifth solar house you will focus on your creativity. If you're an artist you will become a star! It may also be all about your kids and during the month of April you will think about them a lot. You may also focus on your love life if you are single. You may be very happy thanks to a gift coming from a member of your family. Why don't you organize something at home in return? Maybe around full moon? Mercury is in your fifth solar house and you manage to show how good your creations are, especially the things you write. 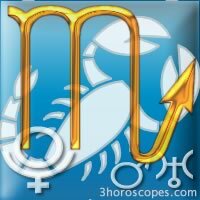 Mars is in your seventh solar house and you will have to be receptive to your partner and co-workers. But make sure they don't walk over you! Pluto is in harmony, you will live a second life with a new strength, magnetism and faith. Saturn is in harmony and you make sure you take stock of the situation as far as your social progression and your health. You may take a few wise resolutions. Good aspects of Venus to your sun in the week of 14 may favor encounters, hugs and gifts. If you're in a relationship, your partner will give in to your charm.